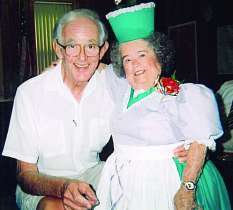 ‘Wizard of Oz’ author’s descendent to make appearance at DeBary Christmas Parade “Frank was my mother’s first cousin, so he makes me his second cousin,” Goettel, a DeBary resident, explained of the connection to the prolific author, who wrote, The Wonderful Wizard of Oz, which inspired the classic movie. “I’m the last nephew to Auntie Em.” Goettel explained that Baum was inspired by their Aunt Emily Ingerson Waren, and the time he spent on her farm in central New York, to include her in his classic tale. “She was a real homebody,” Goettel explained. “He admired her ways, her strengths, her cooking.” Goettel added that Baum was also inspired by his niece, Dorothy, whom he visited in Kansas in the early 1900s. “His favorite niece, Dorothy, with her parents, moved to Kansas,” he explained. “He went out to visit her and stayed with her, because she was very sickly at a young age.” The DeBary Christmas Parade will take place at 3 p.m. along N. U.S. Highway 17/92, between Spring Vista Drive, and Poinsettia Drive in DeBary. This entry was posted in Oz Events. Bookmark the permalink.